We lived the space and views and the staff were beyond friendly and helpful. Spacious apartment with all the facilities families need. A beautiful balcony overlooking the ocean. The kids pool was great and the staff couldn't do enough to ensure we had everything we needed. A great stay, we will definitely be back! Loved being back at the Ocean club. Our apartment was exactly where we wanted it and was must bigger than we expected! The staff were also very friendly and helpful! The willingness to help and the attention to detail. Perfect location near the pool beaches supermarket and restaurants. Apartment roomy and clean could do with some modernization but suited our needs. view from balcony amazing,looking out over Luz bay would never get tired of that view. WiFi perfect for my 2 teenagers. Nice atmosphere at pool bar and gr8 pizzas at garden restaurant pity they don’t offer a little bit more variety of different dishes. Lovely spacious apartment, with all mod cons. 5 mins walk to Supermarket, pools and beach. Lock in a great price for Luz Ocean Club – rated 8.2 by recent guests! One of our best sellers in Luz! 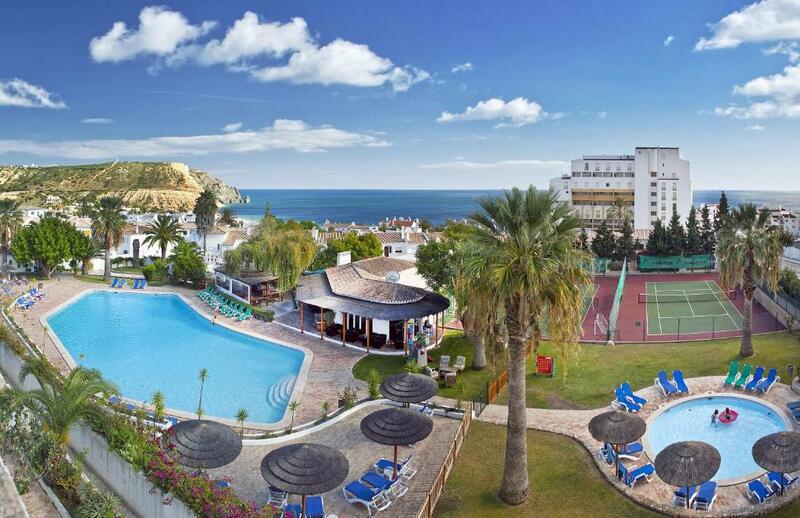 Located in Luz, Luz Ocean Club offers 2 outdoor pools. This self-catering accommodations features free WiFi in public areas. The property is 1,650 feet from Luz Beach. The apartments will provide you with a balcony or a patio or a terrace. There is a full kitchen with a microwave and an oven. Featuring a bath or shower, a bathroom also comes with a hairdryer. You can enjoy sea view and pool view from most of the apartments. Guests can enjoy a light meal or a snack from the on site snack-bar/pool bar (mid April to October). The property offers free parking. Faro Airport is located 56 mi from the property. This is our guests' favorite part of Luz, according to independent reviews. 뀐 Located in the top-rated area in Luz, this property has an excellent location score of 8.7! When would you like to stay at Luz Ocean Club? This apartment features a tile/marble floor, dining area and seating area. Photos are from multiple apartments. Facilities are guaranteed, but style and layout will vary. This apartment features a tile/marble floor, dining/seating area. Photos are from multiple apartments. Facilities are guaranteed, but style and layout will vary. House Rules Luz Ocean Club takes special requests – add in the next step! Luz Ocean Club accepts these cards and reserves the right to temporarily hold an amount prior to arrival. - November to April: from 09:00 until 17:00. Closed on weekends. - May to October: open from 08:00 until 21:00, 7 days per week. - If arriving after hours, please contact the property. - Bed linen & Towels: EUR 12 per person. Optional Services not included in the price (available for pre-booking. Booking at the resort is subject to availability). - Bed linen change: EUR 12 per person. Please note that photos displayed are generic and may differ from the apartment that will be allocated, as these are all privately owned and furnished to the property owner's taste. Please note that the distance from the pool and beach may vary , depending on location of the apartment within the complex. A damage deposit of EUR 150 is required on arrival. That's about 168.82USD. You should be reimbursed on check-out. Your deposit will be refunded in full, in cash, subject to an inspection of the property. There was no air conditioning, so it made it extremely uncomfortable to sleep. The beds are very hard as well. The cleaner will only come once a week, and the rubbish piles up if you have kids. The pool is extremely cold as well. The apartment did need a bit of a clean - especially the walk in shower. A good deep clean and the place would be amazing! We asked them to replace some broken light bulbs and they forgot. Other than that everything was great. Apartment was run down , dated , dirty and all beds were uncomfortable and creaky. tv reception was useless. The beds were creaky and uncomfortable, there was no electric kettle and too many satellite dishes spoiling view from balcony. It was clean and in a central location. The apartment did not leave up to the expectations we had for the price we paid. No aircon and all inventory was of poor quality. Some of the details in our confirmation were not correct. We were instructed to check in to the Palm Bay reception, but this no longer existed. Thankfully, a simple phone call (even at 2am) meant we were quickly directed to the right place for an efficient check-in. The closure of the Mirage restaurant and bar (at the Mill Pool) was also a bit of a surprise. Documentation had indicated that this was still open, but alas this was not the case. The Ocean Club is a dispersed club around numerous centres and maybe this could have been the central focus to keep things more joined up. There is no pool (or poolside) entertainment laid on, so people have to fend for themselves. There was an indication in the documentation that some (albeit light) entertainment programme was still being laid on, so the lack of it was a slight disappointment for my 15 year old son. However, once again, this was not a major issue as we had plenty to occupy ourselves with and make our own fun, but it may prove to be more of an issue for those with children who become easily bored. So, although I have listed some things that were in this less favourable section, they are there to offer a fully balanced view and (for us, at least) could only amount to a total 1-2% reduction in the overall quality of the Luz Ocean Club holiday experience. Privately owned apartment, with each one decorated differently and with a differing level of comfort, so we were in lady luck's hands about what we would get. The one we were provided with was a beautifully appointed 2 bed apartment (one double en-suite, one twin with separate bathroom, both bathrooms being set up as wet rooms), air conditioning in each bedroom and the main living area, an excellent kitchen (with good sized fridge and freezer, oven and separate microwave, hob, dishwasher and washing machine). The living area was beautifully laid out with a nice relaxing lounge area, plus a nice indoor and outdoor dining area. There was a small TV in the double bedroom, and a large flat screen in the lounge area. Free (and good) wifi was available throughout the apartment, as well as a surround sound speaker system which was easy to connect (bluetooth or wired) to TV, MP3 player or other technology. It was spotless on arrival, and cleaning (plus towel and linen change) was provided twice a week for our fortnight's stay. There is more than one pool area, with the Mill Pool being the quieter centre and the Garden Pool being a little more lively. However, don't expect a fight for space or sunbeds. Whichever day we strolled to either centre, four sunbeds complete with sheltering parasol were always available for our family. No early "reserving" system operated throughout the stay. Very friendly and efficient at reception on check-in, despite it being 2am. Whenever we had any issue or a question that we wished to raise, the answer was always answered quickly and accurately. Lou(isa) who managed the reception of guest to the Garden Pool was just perfect. She has lived around the area for many many years, so anything you need help on you just need to ask her. And even if you don't have anything to ask her then just chat with her because she will have a story to tell for every occasion. Quite simply, a lovely lady.